We've had some stormy weather the last few days here in Minnesota. A tree fell over a neighbor's house and another neighbor had their garage destroyed by another fallen tree. So it wasn't a big surprise when the emergency alerts feature kicked in on our iPhones. A while back Apple added a neat feature to the iPhone. If the government issues an Amber or Emergency Alert in your area your iPhone can alert you through the notification center feature. As we discovered the alert will light your phone up and will play an alert tone not all that different from the alert tone you would hear on your television. 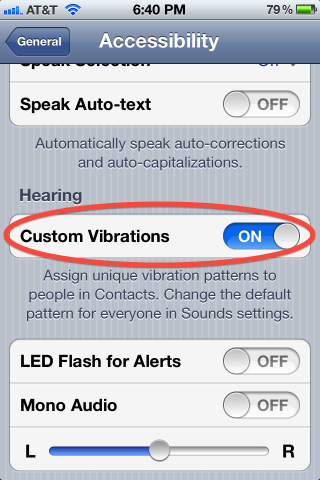 If your iPhone is on silent mode it will vibrate instead. At first I was excited to discover this great feature when it alerted us to a government issued flood warning in our area. It was about 8 pm and the alert was in effect till about 2 am. What a great feature I thought. Then the alert went off again at about 11 pm. The flood warning was extended till 3 am and it was giving us an update. This wouldn't have been a problem except my wife had just gotten to sleep and we keep our phones next to our bed. Like many people, we use our phones as an alarm clock. Also, sometimes you want to play a game or check the news before getting out of bed. Near 1 am the alert went off for a third time which is when my wife asked me how to stop it. At first I though I would have her turn on the Do Not Disturb feature but then paused. Do Not Disturb is designed block calls and alerts but it also lets emergency calls through. These alerts, by their very name, are considered an "emergency" and might be let through. Since I had no way of easily testing this because I can't create my own emergency alerts, I showed her how to turn the alerts off entirely so she could sleep in peace through the night. She then suggested that I share this story with all of you. Obviously for safety I don't suggest just turning Emergency Alerts off casually. But we really needed the sleep and our home is not in an area that floods. So we checked local news websites for information about the storm to be safe and decided we no longer need the updated alerts through the night. If you are in a similar situation here is how to turn the alerts off. Go into your settings on your iPhone and find the Notification Center section. Scroll down the very bottom of the menu and you'll a section marked Government Alerts which you can toggle on and off. Switch these off and remember to turn them back on again later if you wish. Be safe everyone one, but also try to get some sleep.